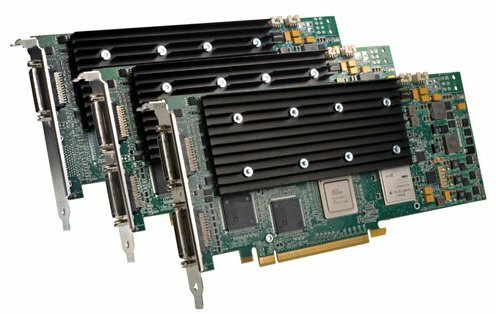 Matrox Graphics Inc. announced today the introduction of three new fanless Mura™ MPX Series video wall controller boards that build upon the line’s revolutionary design. Mura is the first PCI Express (PCIe) x16 Gen 2 board class to feature both HD resolution inputs and outputs. The new fanless SKUs make use of the same high-performance, single-slot design with 64 Gbit/sec duplex data transfer and feature four HD outputs and either zero, two, or four HD inputs for maximum I/O flexibility. The fanless Mura boards have no moving parts, helping to further increase Matrox’s industry-leading reliability. With the ability to create quieter systems and a jump to three-year warranties, Matrox expects a relatively quick OEM adoption of these new Mura cards. Mura boards can be scaled from just one board to create small video wall controllers to multi-board medium-sized and even very large-sized video wall controllers in order to support a wide range of applications from presentation systems in conference rooms, auditoriums, control rooms, and classrooms to collaboration systems used in surveillance and process control systems. With support for HDCP capture and output, the Mura line is also now very popular in advanced digital signage solutions. Also available are Mura single-slot PCIe x4 analog video input boards featuring either 8 or 16 inputs and 8 Gbit/sec duplex data transfer. Each is compatible with Mura input/output boards for the capture of additional analog inputs on a given video wall for greater customization. Additionally, Mura third-generation SDI PCIe x16 controller boards, which capture and display SDI video, support two 3G SDI inputs and two DVI outputs and feature 32 Gbit/sec duplex data transfer. All the Mura MPX Series products listed above are accompanied by three-year warranties. The Matrox Mura MPX Series fanless display wall controller boards and accompanying development kits will be available as of April 2012. Fan-based models are also available and in some instances may be better suited to meet specific system requirements.